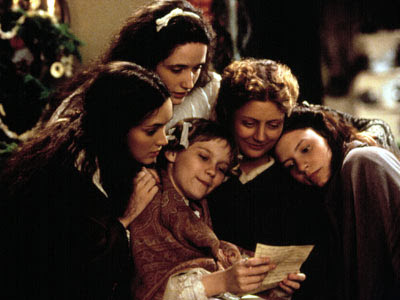 Please go rent/borrow/add to your Netflix queue Little Women--The Winona Ryder/Christian Bale/Susan Sarandon version. Ideally, I'd like you to read the book first (the unabridged one, of course), but I'll settle for you watching the movie. I don't know what it is about this story that just gets to me. I've read the book too many times to count and watched the movie nearly as many times. It never gets old. And every single time, I still hold out hope that Jo will marry Laurie. It just makes my heart ache when I see it. He's so totally in love with her and she's so totally not in love with him. I dare you to watch (or read) Little Women and not want to shake Jo until her teeth rattle when she refuses Laurie's proposal. Sure, sure...She ends up with Friedrich, who is a good man, but she and Laurie are meant to be together. It's destiny. Amy should have drowned in Walden Pond. Don't tell me you haven't thought the same thing. And when you're done with Little Women, go read (or watch) the Anne of Green Gables series. Just don't watch the last movie--it doesn't even remotely follow the books.